Update: Due to the smoky conditions this week, the Superintendent’s State of the District, LCAP Updates and Workshops previously scheduled for 11/15 is being postponed. The Superintendent will give a State of the District presentation at the Board meeting on 11/28. Another public presentation, LCAP Update and workshops will be held in January, date TBD at this time. 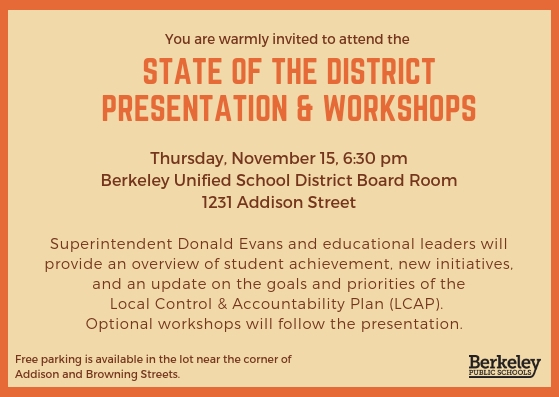 Please join Superintendent Evans and educational leaders at this annual event designed to provide a State of the District presentation, an update on our Local Control and Accountability Plan, and engaging workshops that will allow participants to dig deeper into data, budget, and parent leadership. To arrange childcare at the event, please contact Lorraine Mahley at lorrainemahley@berkeley.net or by phone: 510-644-6202. 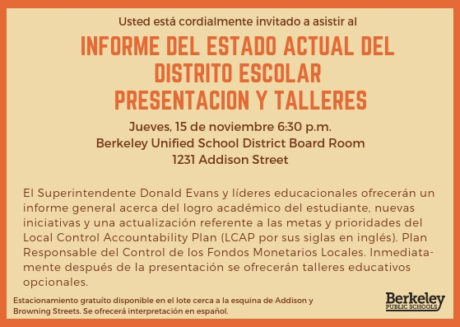 Para reservar cuidado de niños durante el evento, ponerse en contacto con Lorraine Mahley lorrainemahley@berkeley.net o por teléfono: 510-644-6202.